Comfortable to hold and easy to use, the manual inline pipette controller was designed with an ergonomic grip and bulb for simple and precise operation. A “T” bar thumb lever on the Manual Pipette Controller from Heathrow Scientific controls the aspirating and dispensing speeds from serological pipettes from 1 to 100 mL in size. 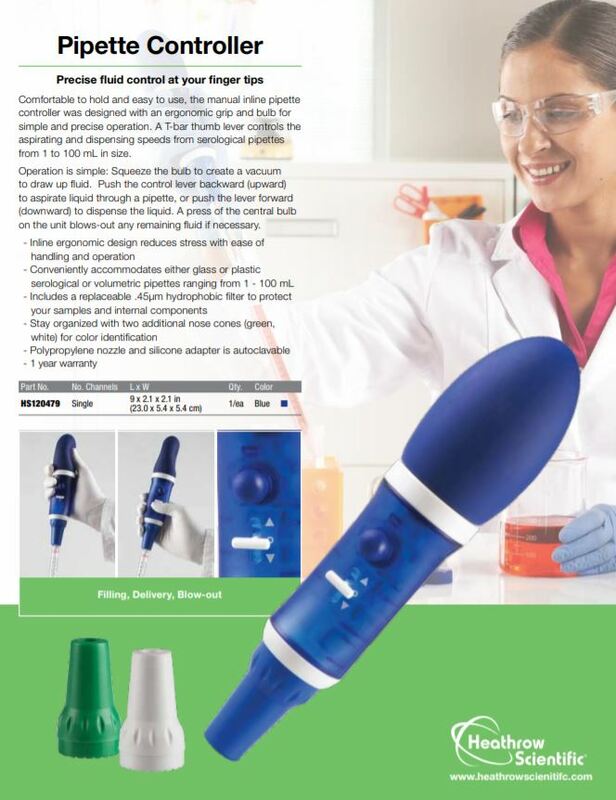 The Manual Pipette Controller from Heathrow Scientific gives you precise fluid control right at your fingertips. The Manual Pipette Controller from Heathrow Scientific conveniently accommodates either glass or plastic serological or volumetric pipettes ranging from 1 - 100 mL. The package includes a replaceable 0.45 μm hydrophobic filter to protect your samples and internal components of the Manual Pipette Controller from Heathrow Scientific. Keep your workspace organized by using the two additional nose cones (green, white; included) for easy color-coded identification. The polypropylene nozzle and silicone pipette adapter are autoclavable. The dimensions of the Manual Pipette Controller from Heathrow Scientific are 9 x 2.1 x 2.1 in (23 x 5.4 x 5.4 cm) and the unit comes with a 1 year warranty. Operation of the Manual Pipette Controller from Heathrow Scientific is simple and intuitive: Simply insert the serological pipette into the Manual Pipette Controller from Heathrow Scientific, squeeze the bulb to create a vacuum, submerge the end of the serological pipette under the surface of the liquid you want to pipette. Then, in order to draw up the liquid, push the control lever of the Manual Pipette Controller from Heathrow Scientific backward (upward). This will aspirate the liquid through the serological pipette. Then transfer the serological pipette to the vessel into which you want to dispense the liquid, and simply push the lever forward (downward) to dispense the liquid. A press of the central bulb on the unit blows-out any remaining fluid if necessary.